Cohort Analysis is an analyst-facing PhysiData tool that enables the user to analyse outcomes data from a defined group of patients ( Cohort). Cohort Analysis is contained within Physitrack's enterprise license tool - Physitrack Direct - and is enabled by Physitrack when there is an active PhysiData subscription. When a PhysiData subscription is active, Cohort Analysis is visible in the left-side Analytics navigation tab. Results are shown in tables, and with charts if the "Show Charts for Each table" box is ticket. NOTE: Choose Outcome Measures or Adherence with the Show Summary dropdown on the right hand side. The top 20 results are shown on-screen, full results are available using the Download link. The Chart output shows the individual observations in the selected cohort in green and the average observation for the cohort in blue. The chart is sorted by Final Reported Outcome Measure (FROM). 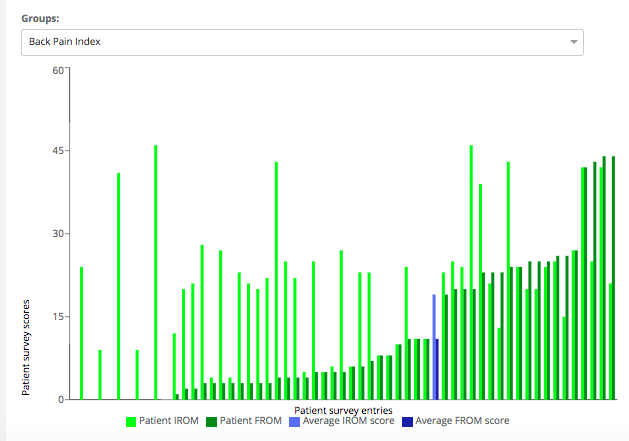 (note if a patient only provided one outcome measure score, then IROM = FROM).